In the last decade, customer relationship management (CRM) platform adoption has increased rapidly to meet the speed of business. Enterprises of all sizes and types are adopting CRMs as the norm. CRMs offer a single source of customer information and reduction in paper. Most importantly, they allow companies to do business more rapidly and with greater agility. 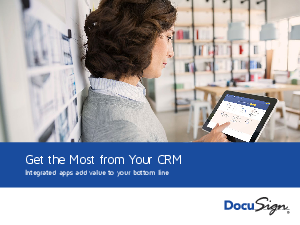 Read this eBook to learn how you can extend the value of your CRM system to see increases in operational efficiency, lead conversion, customer satisfaction, and sales revenues.